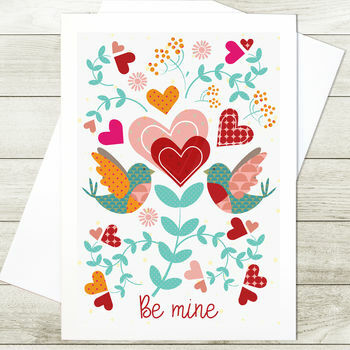 A scandi style valentines card featuring love birds. Wish your loved ones a happy Valentine's with this scandi style card featuring an illustration of two birds, flowers and hearts. The cards are made to order, and blank on the inside for your own message. You can choose for a message to be printed inside by selecting the relevent option. Made to order. Printed on Fine Linen textured card, 270gm. Supplied with a white envelope and packed in a cello wrapper. This product is dispatched to you by Ink Pudding.